Flat sharing is the new trend in Jakarta now. As the living cost of Jakarta has increased, plus it is not really nice to live alone in a big city like Jakarta, many expats and Indonesians are opting for flat sharing when they move to Jakarta. As the capital city of Indonesia, Jakarta has many attractive factors that lure both Indonesians and foreigners to come and stay in the city. Playing big role in this country`s economic growth, Jakarta now has become the hub for many international companies. That`s why it is easy to find foreigner workers here. Plus, there are new trends among young professionals to stay in flat, than in their house, especially for those who come from the other cities. Besides of that, there are many well-known and well-established national companies that put their headquarters in Jakarta, which means there are many vacancies available in this city. Hoping for a better life is the major reason why many people simultaneously and eagerly come to Jakarta and looking for a job especially, after Lebaran or Idul Fitri. 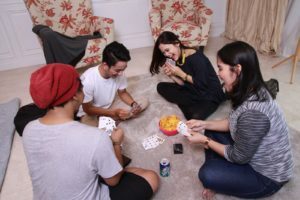 For expats or Indonesian, flat sharing is wise decision to survive in Jakarta as well as cutting the living cost and of course, makingnew friends. Whether you are an expat or Indonesian who are looking for flat to sharing, there are few things to consider before you make the decision. Find the best flat. There are many flats available in Jakarta for rent. From the north to the south areas, you will be spoiled with numerous choices of flats. But, finding the best flat as your expectations in Jakarta is not easy. Here are some considerations before choosing a flat as your living space. Location matters. For some people, especially young professionals and expats will look for flats near their office. As you know traffic in Jakarta is the last thing you would wish to encounter in your live. The congestion in Jakarta is getting worse every day and you have to off early if do not wish to stuck in the congestion and late to work. You can try to look for flats near your office, or at least the nearest place to your office. This way, you can save your time because you can reach the office by on foot and also cut your accommodation cost. When you have some flats building in mind, take your time to do some surveys. See if the flat is the living space you are looking for. Pay attention to its space, furniture, security, cleanliness and hygiene. Good tips for expats, if you are not familiar with Azan (calling for Muslim to pray), you may consider choosing flat that is not directly facing a mosque because it will make you get up earlier in the morning. And if you are a hygiene freak, you may not want to stay in flat that faces the big street, because the dust is no joke. Think about the city`s annual problem, too. Flood! Flood is just another social problems in Jakarta aside of pollution and bad traffic. During the rainy season, most of the areas in Jakarta will flood heavily and frequently. During the floods, the traffic will be getting worse. Deal with the landlord. Most of the flats in Jakarta are owned by local people, but there are holes in every regulation right? You may find flats that owned by foreigners too. Recent talk about housing systems in Indonesia indicates that Indonesia President Joko Widodo has agreed to let the foreigners to buy luxurious flats in Indonesia which means there will be more flats and landlord options to face. Talking about the landlord, expats will find it quite hard to deal with the landlord because of these reasons. It is really typical Indonesian landlord to charge more rental fees for foreigners. It is based on the calculation of foreigner`s income in Jakarta which can be double, even triple times more than local workers. Some of landlords will make difficult contract for foreigners, like asking for advance rental cost for 1-2 years, charging extra fees and many more.There is an idea that long has stayed in local Indonesian mind that all the foreigners are rich, so they can freely cost them higher. Well, not all local landlords have bad or mislead stereotypes about foreigners. You are still able to meet lovely and reasonable landlord here. Thus, you need a comprehensive and extensive search of this. It is better to get reference from colleagues or friends about the flat, so you won`t spend many times just to find a right flat with reasonable landlords. If you are Indonesian, talk with the landlord won`t be so hard. But still, you also need to find reasonable and kind landlords that won`t cost you higher that the average price. Rental cost matters.The rental cost for flat in Jakarta is varying, depend on your choice; low-end flat or luxurious and full furnished flat. Determine your budget first and then you can focus searching the flat within your budget range. According to Colliers International Indonesia`s report, here are some popular residence areas for expats living in Jakarta, plus its rent cost for 2 – 3 bedrooms per year. Please keep in your mind that many landlords will ask you to pay 1-2 years rent cost in advance. But, if you just stay in short period in Jakarta, you may have good talk and negotiate with the landlord in terms of the rental cost. This cost range is not a fix number, but, you can use this number as the guide. Your preference. If you are not really care whether your flat is near your office or not, you may consider few popular neighborhoods to choose. Especially if you are an expat that wants to feel Jakarta`s real vibe and meet local people. Located in the middle of Jakarta, Menteng is convenient areas to be if you are working in international or national businesses and industries. It is easy to commute from Menteng to your office, because you can access public transportation, Transjakarta buses or taxi, to get to your office. You can easily find flats in Menteng, too but the cost won`t be cheap. And because Menteng is located in the center of the city, you have easy access to enjoy the modern features of Jakarta. This is the most popular neighborhood for expats and young professionals to stay. Located in the northern side of Jakarta, Kemang offers various nightlife entertainments which is compel with foreigner`s culture. There are many international and national companies, too. But keep in mind that Menteng usually floods heavily during rainy seasons. It is a nice place to live with plenty choices of dinning places, drink, and entertainment. The area is accessible to public transportation, too. But, the traffic is the main issue in this area. Prepare to face long congestion! Located near Kemang, Kebayoran Lama offers more affordable living cost than Kemang. There are a lot of neighborhoods to choose in this area, for example, Cipete/Cilandak, Gandaria, Permata Hijau and Pondok Indah. But please expect long and boring congestion at the evening where everyone back from work. This northern area of Jakarta is not favorite place for expats to stay, but it does have many flats and entertainment centers. But the area is quite far from the city center that makes you need to off early to office and it gets floods every year, too. Find the right roommate. In flat sharing, the existence of a roommate is essential. You are going to move into a flat with him or her and that`s the very reason why you have to find the right roommate, because you are going to spend your stay in the flat with him. Everyone doesn`t want to encounter awkward moment with their roommate, right? There is no perfection in this world and it is wise not to ask for perfect roommates. You just need to find right roommate. This is why looking for roommate is not easy. You have to find the roommate that has same expectation as yours; from the cost, the location, rules and preferences. However, finding the best roommate is not impossible at all. Here are some tips of how to find the right roommate for you. For expats, there are some expats forums you can use to advertise yourself. You can create new thread there and write that you are looking for a roommate. You must state your rules clear there. For example, age between 19-25, male/female, looking for flat in Sudirman area (for example) and many more. This way, the other users from the forum that has same interest with you will be easily evaluating themselves if they are right person as your roommate. Or you can scroll down the thread and look for someone that is looking for a roommate in your preference area of living. You can read their rules and if you are okay with those, give them a call! For Indonesian, you also can also use forums or social media to find flat sharing roommate. Once you find the candidate, talk openly about your rules, your expectations, and of course the cost! Let your roommate knows every detail and let them say their preferences too, to see if you both have same need. Be honest and be kind to your roommate candidate even if she is a total stranger to you. Once you respect them, they will respect you back and you can live happily in your shared flat. By taking these things into your consideration, hopefully you will find the right flat with the best roommate to live. Jakarta is a modern city with tons of good things to see. Feel free to explore the city and feel the vibe where modern lifestyle meets traditional and religious atmosphere. Despite of its awful traffic and flood, Jakarta is a nice city to live in, both for Indonesians and expats. It offers wide selections of entertainments, beautiful skyline, countless dining areas, international singers’ gigs, international shows, festivals, and many more. Expats may find that alcohol is quite expensive here and there are certain clothes restrictions especially for female. Aside of that, Jakarta is candy land with numerous high-end malls, outlets, cafes, restaurants and bars.